Lathem Sonachron DWA-S (Requires optional Horn). Automatically ring Horns/Bells to control employees Start/Stop and Lunch Breaks. Buy from Time Clock eShop.com and save. NOTE: The Lathem Sonachron Does NOT have a built-in horn. Purchase the optional Horn or Bell signaling device, for a complete system. The Sonachron Signal Control and Program Timer is ideal for schools and industry. 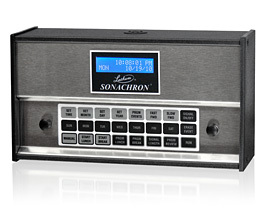 The Sonachron is a dual-purpose, single circuit program timer, ideal for signaling horns and bells to Alert personnel of Shift Start/Stop times and Lunch Breaks, etc. or for controlling the On/Off status of electrical devices such as HVAC or appliances. A huge asset for your building's GREEN efforts. The Sonachron is user-friendly, with a front-mounted keypad that lets you program the exact minute and weekday(s) of each event.